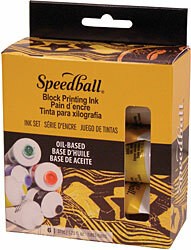 Oil based block printing ink are suitable for printing on papers and fabrics (takes 2-3 weeks to cure on fabric). These high quality ink are non-darkening, waterproof, permanent and clean up with mineral spirits on other solvents. Set includes six 37cc tubes in blue, red, yellow, green, black and white.